Join the countryside ranger and have fun helping to hunt for Skate/Ray egg cases (mermaid’s purses) along the shore at Torrisdale Bay and Melvich Bay. Let’s see who can find the most and win an Easter egg. We will try and identify any egg cases we find and the results will be sent to the Shark Trust to help protect these fascinating fish species. Torrisdale Bay 15/4/06 - meet at car park at the Strathnaver Bridge by the Skelpick Road (grid ref: NC 711603) at 10.30am. Melvich Bay 16/4/06 - meet at Melvich Beach car park (grid ref: NC 887648) at 10.30am. Sunday the 16th April Dunnet Beach. There are more than 14 different species of Skate & Ray around the British Isles. Many of these cartilaginous fish, related to Sharks, are in decline. You can collect eggcases at any time, skate and ray eggcases are washed up on to our beaches all year round. The best time to look, however, is after stormy weather when lots of seaweed and debris have been thrown up on to the beaches. Eggcases are often found in amongst seaweed on the strandline, so keep your eyes peeled they can be difficult to spot at first. 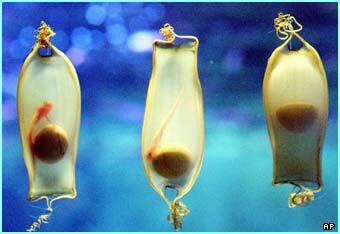 Eggcases are very light when they are dry and the wind can blow them up the beach. The back of the beach, along cliffs or dunes can often be a fruitful location to search. It is a great activity and gets you out of the house and enjoying nature whatever your age. Personally I am organizing an eggcase hunt on Strathy beach on Saturday 15th April and then Sunday the 16th April I will be on Dunnet Beach. If you wish to join me, or even organise your own little hunt on a beach close to you, then you can contact me for more details and I will send you out an ID guide and recording form. The results for 2005 have now been collated and over 2100 eggcases from 142 different beaches around the UK and Ireland were found. Unfortunately no beaches around the north of Scotland or even above Aberdeen were included. Let’s make a difference this year and see what the Far North has to offer.